Well, I just published a goal setting planner workbook on my online shop! It’s a printable workbook, meaning you’ll download it and print it yourself. You’ll get immediate access to it and you can print how many copies as you’d like. In this blog post I’m sharing the layout of the workbook, including a bunch of its questions. So, if you for some reason don’t want to, or can’t, buy the workbook I hope this blog post will give you an idea of questions to ask yourself and sections to think about when you set your goals for 2017. If you want to more information about the workbook, or maybe get a copy for yourself, you can find it here: My Big Plans – 2017 Goal Planner. Let’s get into it, shall we. When you set goals there are some components that I find are truly important, both to help you set the ”right goals” but also to help you achieve your goals. We’re at the end of 2016, and before we should think about 2017 we really ought to reflect back on the past year. What did you achieve? What did you set out to do but for some reason didn’t manage to get done? This can truly be a difficult section (mentally) because most often we haven’t reached all of the goals and dreams we had at the beginning of the year. However I would say that this is an important step when setting goals for the next year. By thinking about what went wrong you can come up with solutions on how to make sure that won’t happen next year. But of course there are goals you did manage to get done, and other positive things that happened during the year that you also should reflect back on. We have a tendency to put a lot of focus on the negative things in life which makes it important to remember the positive things as well. What memories will you have from 2016? What did you most enjoy about the year? In the My Big Plans workbook you’ll answer a lot of questions to help you reflect on the past year, both the good and the bad. You’ll also reflect on what you’ve learned and how you can use that in 2017 to help reach your goals. The brainstorming sections is probably the section you would commonly think about when you’re about to set goals, but with some twists to it. First of all, to know what goals to set you should be super clear about your bigger dreams and vision for your life. In this section you get to answer questions like – What does success mean to you? How does a dream day look like? You should also reflect on some deeper questions like your core values and the person you strive to be. By putting pen to paper when it comes to questions like that, you’ll know what’s important to you when you’re deciding what goals to set for next year. Which leads to the next section – this is what we normally think about as the very first step when it comes to setting goals. Now it’s time to brainstorm about all the things you dream about, all the things you find important when it comes to all areas in life. Career, family, relationships, finances, hobbies, health and so on. In the My Big Plans workbook you’ll do this brainstorming thinking about where you’ll want to be in five years time. But you can do this with the mindset of 10 years into the future or just where you’ll want to be at the end of 2017. The reason I set five years into the future is because I want you to think bigger than what you could achieve in one year. But thinking about long periods of time, like ten years, just seems so long into the future that it’s difficult to imagine it. And we can come a long way in just five years time. This is the time to think big! Dream away! Shoot for the moon so that if you should fail you’ll land among the stars. You’ll most likely come up with a ton of ideas in the brainstorming session. Now you should take some time and think about which of these ideas you’ll want to work on during the next coming 12 months. Some of the goals will probably be more towards the personal growth side, e.g. having more patience with your kids or spending more time on your hobbies. For these types of goals you might not feel the need to map it out in detail, step-by-step, all the different actions you’ll have to take to reach the goal. But you really should specify them clearly anyways. Write them as one of your main goals and also clarify your WHY. Why is this goal important to you? If possible, make it measurable. I know it can be difficult with goals like this, but give it a try. By making a goal measurable you’ll be able to gauge if you’ve managed to reach it or not. Otherwise you’re in limbo land, never knowing how you’re doing or when you’re ok with the results. You’ll also have goals that actually will require step-by-step action from your side for you to be able to reach the goal. When it comes to these types of goals you should think hard about how many goals you’ll want to put on your list for the next year. Having too many goals can hinder you from reaching any of them because you’re spreading yourself too thin. Once you’ve decided on your goals you should also specify your WHY and make sure you specify a measurable goal. Do that for each of the goals you’ll want to work towards the next year. I would suggest you stick to one to three goals, at least to start with. Once you finish one goal you can of course add a new one. But adding too many goals at once will most often just lead to none of them being accomplished. This is the fun part :) For each goal you’ve set you should come up with the action steps you’ll need to take to reach it. And for some action steps you might want to specify sub-action steps. This way you get a clear path on what it is you need to DO to reach the goal. Once you’ve come up with all the tasks required you should rate them by priority and order. Which ones are important? In which order should these tasks be done? Maybe there’s a task that’s important but to be able to do it you’ll need to do some non-priority tasks first. That’s what you should be thinking about in this step. Another component you can add to the mix is the time estimate for each task. Nothing specific, just a rough estimate. That way when you go through the year, and use this list to help you stay on track and keep you from procrastinating, you have a rough estimate of the time frame for each task. This is something I added to the My Big Plans workbook because I myself have so many things I want to sink my teeth into, and I often don’t know where to start so it ends up on the back burner. But no more! I created a section in the planner specified for this. For each learning item you can specify priority, when you want to do it and a time constraint. The time constraint is there because most often we never feel we’ve learned enough. There’s always more to learn! By having the time constraint, and the specifics of what it is you want to learn, it’s easier to know when you can mark it as completed. I really can’t wait to start using this one myself! I’ve shared with you the different sections I think are important to go through when you work on setting new goals. As I said in the beginning, you can either use this blog post to help guide you through the process, or you can check out the My Big Plans workbook in my shop. What I’ve explained here is actually how the My Big Plans workbook is set up, but of course the planner has more details and questions. It’s designed to go through all these steps, asking you questions to help you find the answers to what it is you want to work on in 2017. And then helping you map out and plan how you’ll achieve your goals. That way you’ll have a solid foundation for achieving your goals in 2017. To celebrate my very first printable planner product I’m giving all my subscribers 40% off from today until the 11th of December! I’ve just sent out an email to my subscribers with the coupon code. However, if you’re not already on the list it’s not too late. If you subscribe now you’ll get the coupon code in an email directly sent to you after signing up. 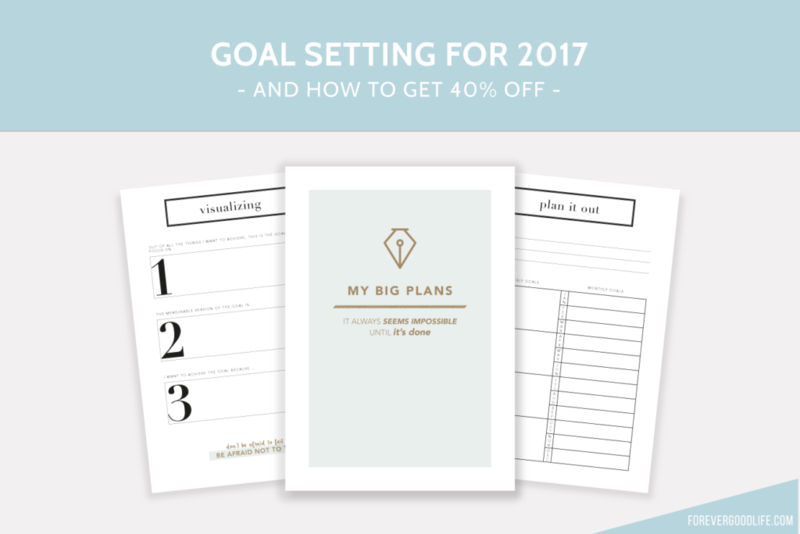 My hope is that the My Big Plans planner will provide you with the tools you need to achieve your goals and create change in your life!